With kids about to head back to school or in some cases already back it's time for the annual reminder about the importance of a healthy breakfast. Skipping it and means your kids will be playing nutritional catch-up for the rest of the day, according to Carole L. Adler, M.A., R.D., a dietitian at the Food and Drug Administration (FDA), because they don't get what they need to be at their best. “Growing bodies and developing brains need regular, healthy meals,” she says. 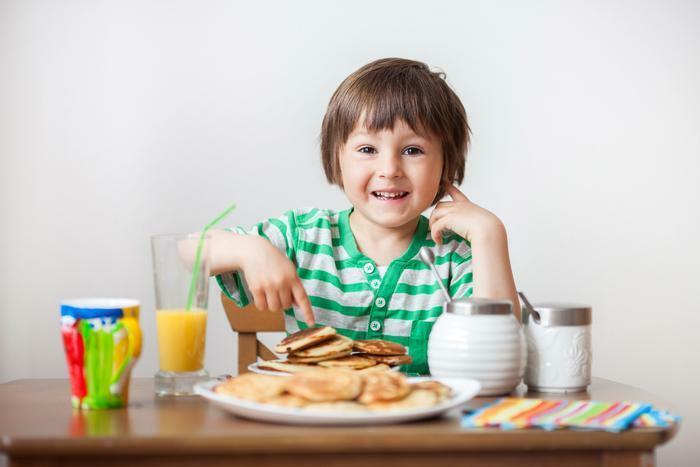 The Academy of Nutrition and Dietetics points out that studies show that school children who eat breakfast perform better in the classroom. As with other meals, it’s a good idea for your kids (and you) to eat a healthy balance of fruits and vegetables, proteins, grains and dairy -- not just for breakfast but throughout the day. It’s neither necessary nor effective to feed them foods they dislike. Do your kids turn up their noses at vegetables but love pizza? Left-over pizza with a whole-grain crust and veggies works for breakfast, too. Or make muffins with zucchini and carrots, and spread with peanut butter or almond butter for protein with a glass of milk. Your kids love sugary cereal? Mix a little bit of that cereal with a whole-grain, nutrient-packed healthier brand of cereal. Keep in mind that nutritional balance is key -- not just for one meal but for foods eaten throughout the day. Not enough vegetables in the morning meal? Prepare extra carrot, celery, and broccoli sticks with a hummus dip as an afternoon snack. Growing bodies need nourishment. And if your kids are physically active, they need plenty of calories to keep them fueled. Adler says having a breakfast that contains protein, fat and carbohydrates helps children feel full and stay focused until lunch. Protein choices might include an egg, some nuts, a slice of deli meat or cheese, or a container of yogurt. Remember, eating on the go doesn’t have to mean forgoing breakfast. Make sure your kids grab a piece of fruit on the way out the door, and hand them a bag of nut-and-fruit trail mix or a whole-wheat tortilla spread with peanut butter or almond butter and a carton of milk. Morning is a busy time for everyone. So take 10 minutes to think ahead and prep for breakfast the night before. Chop up fruit to layer in a yogurt parfait or add to cereal. Cut up vegetables for an omelet. Mix up muffin or whole-grain waffle batter, cover, and put in the fridge. Get out a pan for pancakes or a blender for smoothies. Put a bowl of nut-and-fruit trail mix on the table for kids to grab a handful as they walk out the door. Use the Nutrition Facts label when you shop. “The label makes it easy to determine the amounts of nutrients your kids are getting and to compare one product to another,” Adler says. Make sure your kids get nutrient-dense foods that are low in salt and added sugars.